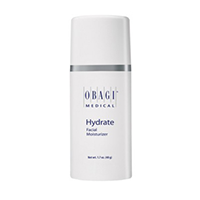 Hydrate Facial Moisturizer isn't just an ordinary lotion. This product is formulated to provide long-lasting hydration for all-day moisture protection. Hydrate Facial Moisturizer contains Hydromanil, a technologically advanced ingredient which retains water and gradually delivers moisture to the skin. So not only does this cream provide immediate moisturization, it also continues to hold water in the layers of your skin over time. In fact, as demonstrated in a moisturization study, Hydrate Facial Moisturizer provides 8-hour moisture protection! Helps to combat skin dryness without clogging pores. Provides all day hydration. Formula is gentle, hypoallergenic and non-comedogenic. Can be used by all skin types.